Nest's offerings are among the best in the business, but their MSRPs aren't very competitive. Luckily, both the Cam IQ Indoor and Cam Outdoor are being discounted by B&H. 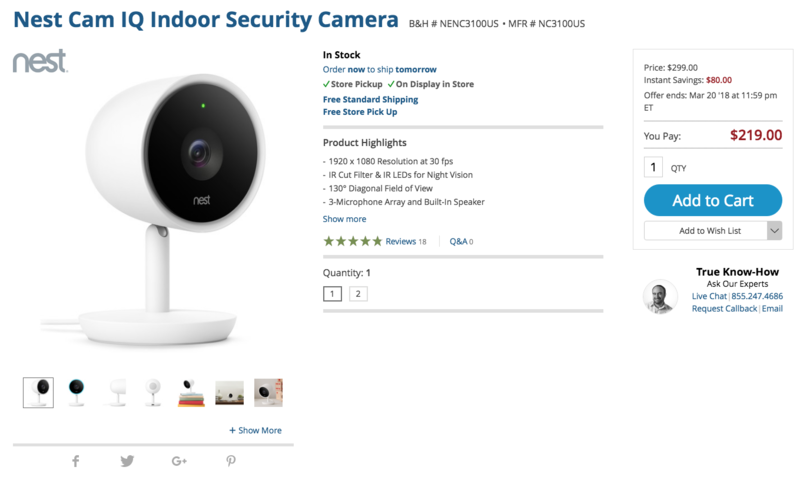 The Cam IQ Indoor is down to $219, making it the lowest price we've seen for it thus far, and the Cam Outdoor has fallen to $169. The Nest Cam IQ Indoor outputs 1080p HDR video, has three microphones on board, and a Supersight feature that follows people in frame. In our review of it, we applauded the video and audio quality, Supersight and facial recognition, as well as the app and setup process, but we weren't fans of the cost and felt that the features could use some fine-tuning. The Cam Outdoor, on the other hand, captures 1080p video with a 130-degree field of view, 8x digital zoom, and eight IR LEDs for night video. $219 is the lowest we've seen the Cam IQ Indoor dip to, making it $30 cheaper than Nest's Black Friday pricing. The Cam Outdoor's $169 price can't make the same claim, but it's still a decent deal if you're on the market. Just keep in mind that both require subscription plans for full use of all the features.